I can’t remember Father’s Day last year, I suspect I dismissed it as a hallmark holiday, a little grumble and moved on. This is my second Father’s Day since Dad died and I’ve been raging all week when I open my inbox!! Now let’s be clear, I like this brand. I like their social media, especially their instagram account, and I like the sentiments in half of this campaign, giving a shout out to the Dads amongst them. 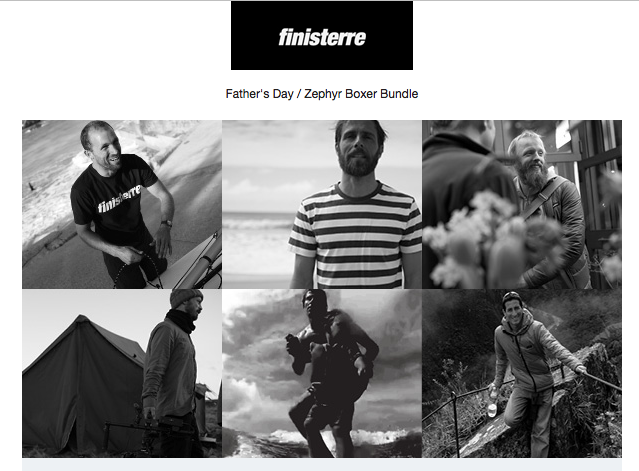 So lots of love for Finisterre. Scroll down one more screen and…. Yes, I can admire the fathers, yes I like what they did there. Then no, just no, no, no. You could have left it as a celebration of them, you could have included a promocode if you had to, you could have featured each item you stock that they like the most, but no Finisterre crossed an invisible line of social media desperation at worse, ill consideration at best – a 2 pairs for £40 boxer bundle? Really? Illustrated with a tight bum and the fine physique of a man (and yes I’m objectifying him, that’s intentional). I can’t think of a more inappropriate father’s day offer, with the possible exception of a 2-4-1 on condoms perhaps! Boxers, would you really want to buy your Dad boxers? Before all your brand agency types get in touch to point out that the market segment being targeted is the wives/partners/husbands of young fathers who you’re hoping will be tempted into a double Zephyr offer for the father of the children in their lives – I get that, but it’s crass to the point of laughable. I’m also aware that by blogging this I’m giving yet more exposure to the Finisterre brand, I don’t mind I like their products and their philosophy and their Cornish’ness. It’s all good, but all week I’ve been tempted to reply to these emails with a one line ‘My Dad’s dead, I don’t want your code/offer/spam thanks. However if you’d like to donate some of your hefty profits to a great cause you can support my #hairhack raising funds for two causes, one of which is the hospice who cared for my Dad as he was dying’. I’ve not sent any of those emails of course, figured they’d be just as spammy, but if you have a spare fiver…. I’m not having a go at Finisterre in particular either. They’ve broken no rules, I signed up for their email newsletter, I just didn’t expect it to include father’s day delights. I’ve not sent any of those raging emails yet and don’t think I will, not this year. I suspect I’m raging partly because it just feels like it’s cheapening father’s. My Dad wasn’t big on Father’s Day (complete hallmark holiday in his view) or indeed presents or belongings or stuff. All he ever wanted for his birthday or any occasion was ‘three well behaved children’. We did alright really in that regard, I think. Although I never bought him boxers! If my Dad was alive today I’d take the time to get in touch, I’d tell him that I loved him, I’d tell him why he was awesome, and what a huge difference he made to my life. Actually no, if life had been different I probably would have never got towards the end of that sentence. I have cancer to thank for providing the opportunity to have those conversations with my Dad, and I’ll be eternally grateful for that. I’ll also similarly be eternally grateful to Rowcroft Hospice who provided the support for us to care for Dad at home as he died. There were many conversations had at the end of Dad’s life that allowed an honesty, frankness and candour that wasn’t a hallmark of our relationship. 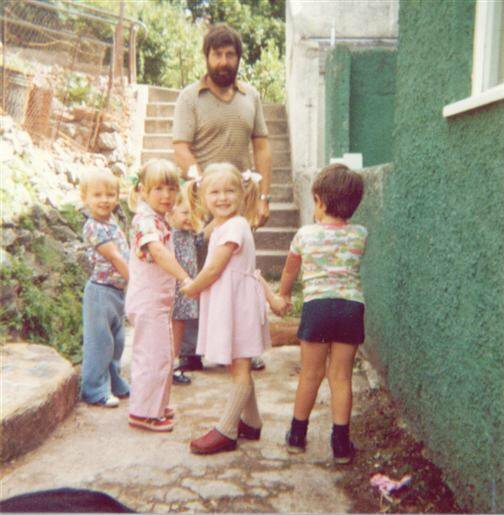 I know that Dad died knowing he was loved, and knowing he’d ‘done a good job’, as a man, as a husband and as a Dad. He wasn’t perfect but he did his best, all anyone can ever ask for really. I’m not really sure where I’m going with this post. I wanted to rant with the world about the ridiculous commercialisation, ever leaking into our consciousnesses via social media. I guess I also wanted to take the time to reflect on what it’s like to be subjected to that barrage when your father has died, or I imagine worse still as a father when your son or daughter has died. Advertising is just that, I’ve no real complaints about it per se, but if you’re reading this on Father’s Day, spare a thought for those who have no father in their lives, some never have (that they knew of), some have died recently, some years ago, it’s a mixed bag that’s all I’m saying, that and if you work in advertising please try a little harder next year!! A good death, a bad death. It matters.